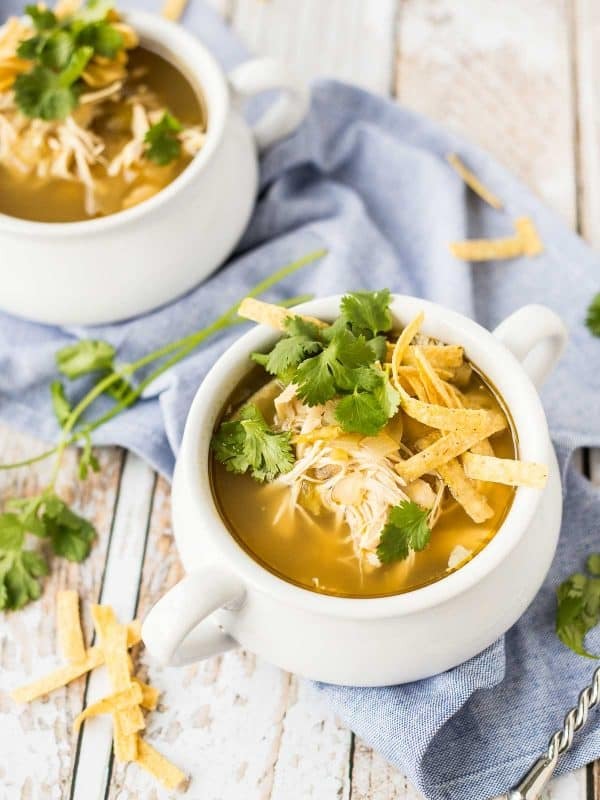 Switch up the chicken soup routine with this easy and flavorful slow cooker 5 ingredient green enchilada soup. Made in the slow cooker! I’m sitting here listening to James Taylor and Alison Krauss and it’s a unseasonably warm, breezy, grey day outside. I want to write something interesting about this soup but really I just want to curl up in bed with a good movie. Well, we don’t have a TV in our bedroom, so I guess I’d be curling up on the couch with a good movie. I get two hours twice a week where I can work kid-free in a coffee shop (N is in preschool this year), and typically I’m ultra-productive during this time because it’s one of the only times I get. Except today. Facebook keeps distracting me, friends texting, people watching, sipping my coffee…and thinking about going back to bed. Plus this soup, while amazing, is pretty simple. Not much to say about it. Which of course is one of the reasons I love it. All you need to do is throw 5 ingredients (all raw!) into the slow cooker and 4 hours later (or 8 on low), dinner is ready. 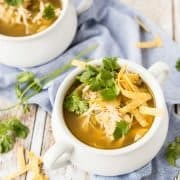 It’s hard to pick my favorite part of this green enchilada soup, the ease of its preparation is definitely up there, but I think my favorite part is that it is desperate for toppings. 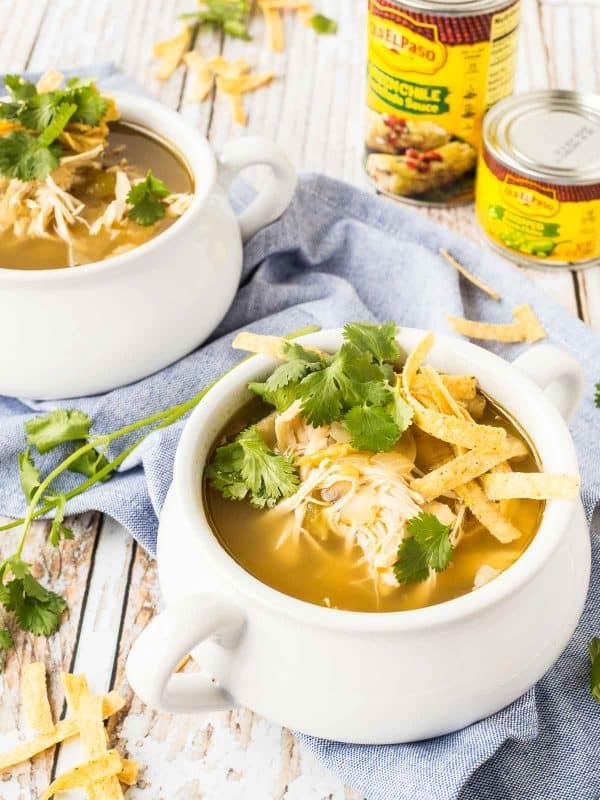 It’s perfect the way it is, especially if you’re feeling under the weather (a great alternative to chicken noodle), but it’s extra great with toppings (they’ll of course add to the ingredient count!). I chose tortilla strips and cilantro, but cheese, avocado, diced tomato, and jalapeño would all be perfect too. I’m obsessed with toppings. I think sometimes I make chili just for the toppings. Tacos, nachos, etc…it’s all about the toppings for me — especially those vegetarian nachos I shared awhile back? Yum. Maybe you’re wondering what the five star ingredients are? 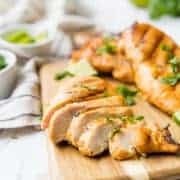 They are chicken, onion, Old El Paso Green Enchilada Sauce (thank you to Old El Paso for sponsoring this post! ), Old El Paso Green Chiles, and chicken broth. No need to dice the chicken or mess with it at all. 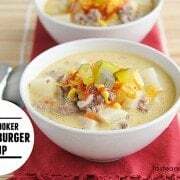 It will shred easily after cooking in the broth in the slow cooker. This soup is comforting and easy and perfect for our transition into winter. 7 quart slow cooker – this is the one I have and it’s on sale as type this! Add chicken, chicken broth, Old El Paso Green Enchilada Sauce, Old El Paso Chopped Green Chiles, and diced onion to a slow cooker. Remove chicken and shred using two forks. Return to slow cooker. Stir and serve garnished with desired toppings. 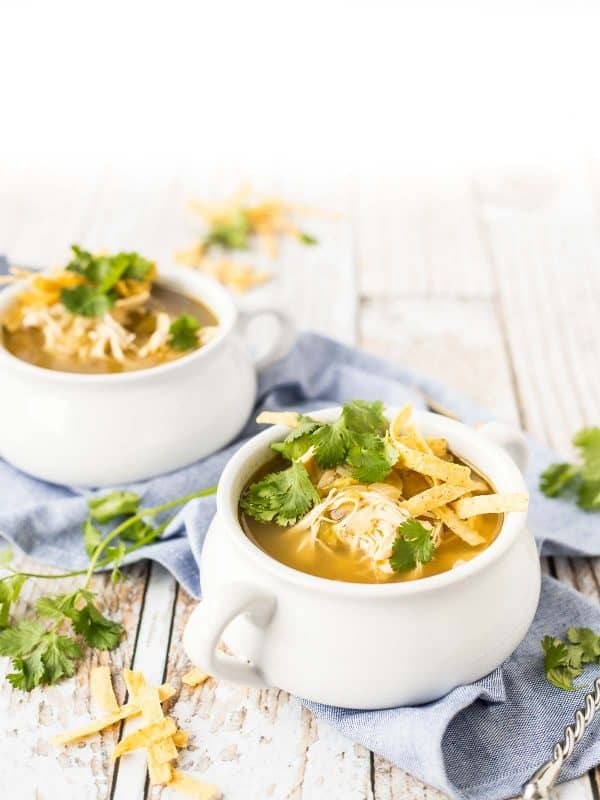 Tip: This soup is great for families because you can have fun with the toppings – I chose crispy tortilla strips and cilantro but avocado, hot sauce, and cheese would all be great options too. Tip: This soup freezes well in an airtight container. Reheat slowly over medium heat in a saucepan (or use the slow cooker again and heat on low until hot). Verdict: Loved this soup — this might be my go-to any time I’m sick! It’s not spicy by any means but it has that subtle undertone of heat that would be great for clearing up your sinuses. First, I’m with you on toppings. The more the merrier, and I want them ALL on this soup. And maybe some sliced radishes, too! Have you ever tried those with a a Mexican soup? Second, I am printing this right now and just wrote “chicken” on my shopping list. Gonna have this for dinner! No but I love radishes on EVERYTHING so I’m sure I’d adore it! I hope you love the soup!!! I love how simple this is to make! I’m adding this to my weekday dinner menu. I’m sure my daughter will love it! I love how few ingredients there are in this recipe – makes it feel so doable – even for a busy weeknight where I don’t get started nearly as early as I should! We love green chile sauce, and I find that the Old El Paso sauce is mild enough for my kids, while still having a tiny kick so they get used to the flavor of chiles. Perfection! Yes! So true about the heat level! Beautiful quick fix dinner! Love it! 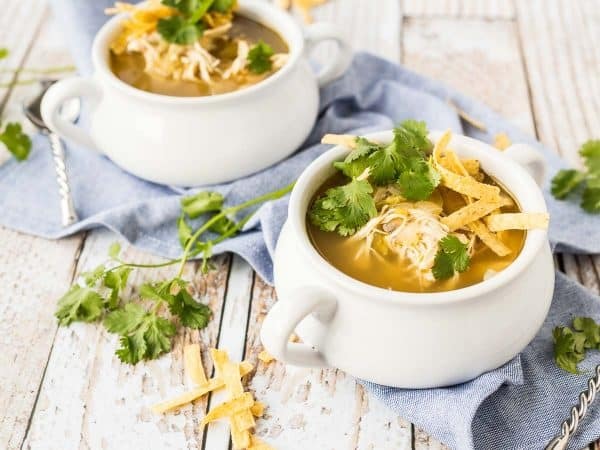 Yum I love green enchilada sauce and this soup is soo perfect for this time of year. Delicious!! Definitely warms you up on chilly days! I really love how simple this is!! I have all the ingredients for this too, about to throw it in the slow cooker! Woohoo! Hope you guys love it! 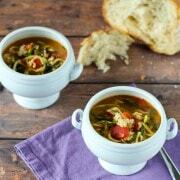 A great soup for Fall and winter. I love how easy it is. My crockpot will love this recipe and so will we! This looks so so so so so good! I crave chicken like a pregnant woman craves — pickles? lol! But seriously! slow cooker recipes are the best! So perfect for fall! I love how simple and easy this is! Can’t wait to try it! I’m obsessed! This flavor combo is so perfect! YUM GIRL! So easy to prepare. Thanks for the recipe. You had me at 5 ingredients! Is this spicy? My kiddos don’t love spice but this looks good!! It has a small amount of spice, but definitely not spicy! Make sure to get the mild green enchilada sauce. Could this be done in a pressure cooker? Thanks! I have not tried it but I imagine it would work! Not sure what the cook time would be though, sorry!